This question is asked quite a bit. It is common for filter manufacturers to indicate that a particular filter is suitable for a tank or pond of a certain size. In many respects this is nonsensical. The amount of filtration required has almost nothing to do with the size of the tank or pond. If you had a 1,000 gallons of water with only a few fish, you probably wouldn’t need any filtration at all since the surface area of the tank would support enough bacteria to handle the ammonia produced. The amount of filtration required depends on the amount of the load, which depends on the number, size and type of species in the tank or pond. The only hard data I have involves my testing of the first Endless River prototype using Biohome BioMotion on a 600 gallon quarantine tank. This filter was able to support an estimated fish load of 30 gr/gallon, a much heavier load than I would recommend, with 10 liters of media. A liter of Ultimate, Mini, Plus and Standard media are all fairly close to 1 kilogram. Doing the math we find that .02 kg/gallon of media is required. As mentioned above this is only a wild guess for any particular situation, but should give safe results to support a pretty heavy fish load using any of the media mentioned. In reality, you will probably want to stock your filter with as much Biohome media as your existing or selected filter will hold. To help you with this is the purpose of the remainder of this document. 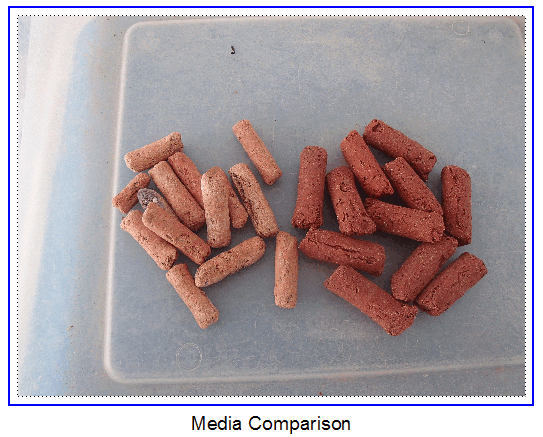 For nitrate reduction 1-2 kg of media is required for 100 liters of water (26 gal) in most cases. See the chart below for more specific guidance. A low flow rate (yet to be quantified) is required. The rate of the denitrification reaction is relatively fast when there is no free oxygen present (< 0.5 mg/l is ideal). The denitrification rate drops to zero when the dissolved oxygen level reaches 2.0 mg/l. The denitrification process partially reverses the effects of the nitrification process in regards to alkalinity concentration. For every milligram of nitrate reduced to nitrogen gas, around 3.57 mg of alkalinity, in the form of CaCO3, are created. This is another frequent question. I placed a tray containing several kilograms of Ultimate in the waterfall of my koi pond. This was subjected to a constant flow of approximately 1,700 gph. After about a year there was noticeable erosion, but it appears to me that it could have gone several more years before it was completely worn away. The photo below shows a comparison between the used Ultimate on the left and new Ultimate on the right. I doubt that media used in aquarium filters will be subjected to this level of flow, so I would expect Biohome media used in aquarium filters to last for a considerable period of time. The manufacturer has indicated that feedback he has received indicates an average lifetime of about five years. Carbon is commonly used in filters, but GreatWave does not recommend it’s use. Since it works by absorption it must be continually replaced and quickly becomes expensive. Similar problems were described to me at a Koi Health Adviser seminar a few years ago by Dr. Saint-Erne, DVM who is responsible for all aquatic health care for PetSmart. A number of Biohome users have reported no longer needing carbon after starting to use Biohome.